Elegance and taste aren’t concepts you’d readily associate with ex-members of Mistress and Fukpig, the Brummie hooligans who stank up the early millennium with their concertedly depraved ASBO sludge/crust. 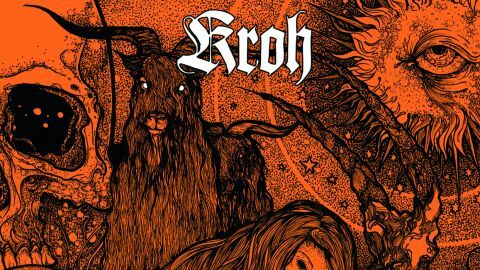 But the second Kroh album rises to a very different challenge, producing a resoundingly heavy solemn and mystical doom metal classic-in-waiting. From a crucial basis in big, valve-crackling riffs and resolute drum-thumping, Altars is shot through with artful touches, perfectly placed ghostly choirs, imperial synths and curious faraway melodies augmenting the expansive guitar tones. Kroh initially disbanded in 2013 after two years, some splits and one limited, patchy LP, but reformed in 2015 with renewed purpose and, crucially, an excellent new singer, Oliwia Sobieszek, whose commanding but anguished melodies and ethereal ululations help elevate Altars far above the current doom herd. With a clear focus on concise songwriting, each tune flows with distinctive, memorable ideas yet never exceeds six minutes. Good thing Kroh had another go, then.